12-14 age category: Pictured are the 12-14 age category winners in the YFCU Floral Art Competition. From left-right: 3rd place winner, Amy Gregg, Glarryford YFC; YFCU President James Speers; 1st place winner, Lucy Rodgers, Spa YFC and 2nd place winner, Amy Smyth, Coleraine YFC. The finals of the YFCU floral art competition, took place at Balmoral Show on Wednesday afternoon. 18-21 age category: Pictured are the 18-21 age category winners in the YFCU Floral Art Competition. From left-right: 1st place winner, Racheal Lamont, Coleraine YFC; YFCU President, James Speers; 2nd place winner, Emma Rodgers, Spa YFC. Absent from photo, 3rd place winner, Jill McCaughern, Glarryford YFC. Under the watchful eye of Judge Karen Frew, competitors showed off their creativity and flair as they delicately placed flowers, foliage and other accessories to craft stunning arrangements. Over 400 competitors had taken part in the floral art heats and it was a remarkable achievement for the finalists to showcase their artistic ability at the prestigious agricultural event. YFCU president, James Speers was on hand to announce those that placed and Karen Frew presented the awards to the winners. 12-14 age category - 1st place Lucy Rodgers, Spa YFC; 2nd place, Amy Smyth, Coleraine YFC; 3rd Amy Gregg, Glarryford YFC. 16-18 age category: Pictured are the 16-18 age category winners in the YFCU Floral Art Competition. 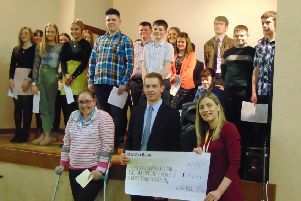 From left-right: 2nd place winner, Lauren Millar, Moneymore YFC; YFCU President James Speers; 1st place winner, Dione Stewart, Kilrea YFC. Absent from photo: 3rd place winner, Connor Woods, Annaclone and Magherally YFC. 14-16 age category - 1st place, Emma Mills, Randalstown YFC; 2nd place, Cara Millar, Coleraine YFC and 3rd place, Katie Marshall, Castlecaulfield YFC. 16-18 age category - 1st place, Dione Stewart, Kilrea YFC; 2nd place, Lauren Millar, Moneymore YFC and 3rd place, Connor Woods, Annaclone and Magherally YFC. 18-21 age category - 1st place Racheal Lamont, Coleraine YFC; 2nd place, Emma Rodgers, Spa YFC and 3rd place, Jill McCaughern, Glarryford YFC. 21-25 age category - 1st place, Gemma Dickey, Randalstown YFC; 2nd place, Rosalyn Magee, Spa YFC and 3rd place, Lynsay Hawkes, Seskinore YFC. 14-16 age category: Pictured are the 14-16 age category winners in the YFCU Floral Art Competition. From left-right: 3rd place winner Katie Marshall, Castlecaulfield YFC; 1st place winner, Emma Mills, Randalstown YFC; YFCU President James Speers; 2nd place winner, Cara Millar, Coleraine YFC. 25-30 age group - 1st place, Sarah Thompson, Randalstown YFC; 2nd place, Janet Broome, Spa YFC and 3rd place, Melissa Millar, Kilrea YFC. The floral arrangements were then moved to the Healthy Horticultural area where they will be exhibited for the duration of the show. The association would like to take this opportunity to thank Karen Frew for judging the competition. 25-30 age category: Pictured are the 25-30 age category winners in the YFCU Floral Art Competition. From left-right: 2nd place winner, Janet Broome, Spa YFC; YFCU President, James Speers; 1st place winner, Sarah Thompson, Randalstown YFC; 3rd place winner, Melissa Millar, Kilrea YFC. 21-25 age category: Pictured are the 21-25 age category winners in the YFCU Floral Art Competition. From left-right: 3rd place winner, Lynsay Hawkes, Seskinore YFC; YFCU President, James Speers; 1st place winner, Gemma Dickey, Randalstown YFC; 2nd place winner, Rosalyn Magee, Spa YFC.